I'm back in the land of computers and real life after a brief sojourn to Wales where it rained a lot. Although we were camping, we were fine as we prepared as always... But the non-stop rain on Saturday plus the lack of light, made it a tiring day. Yesterday the weather did break, thank goodness! So packing up wasn't too arduous, but I didn't get home until gone 10pm as Richard and I sat at services plotting for a long time. This means that today I am rather brain dead and not capable of saying much more than 'urgh'. 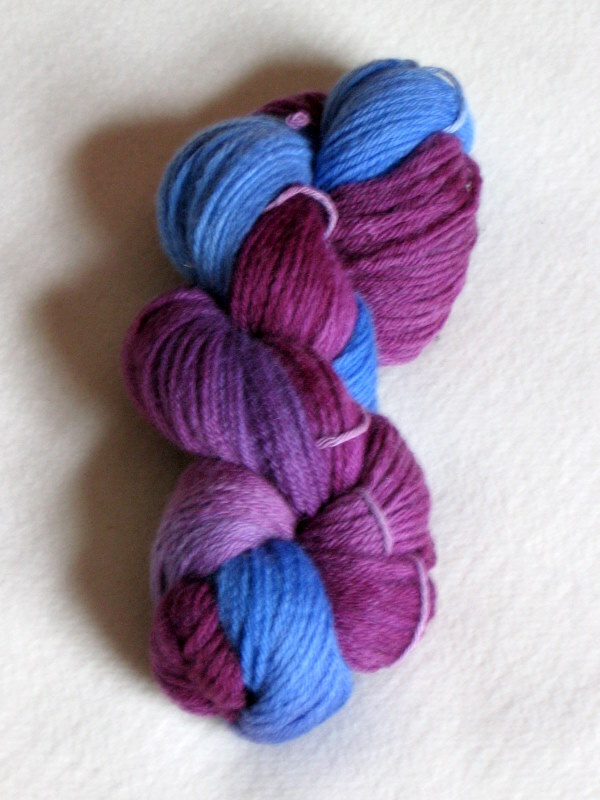 This is a brief post really, to show off the yarns I dyed up last weekend. 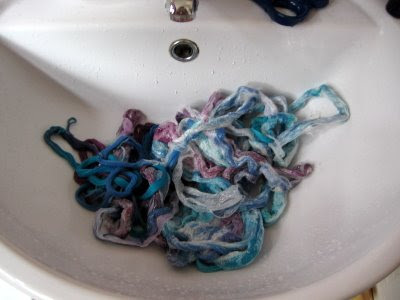 I very deliberately placed just the ends of the skeins in the dye bath's and then encouraged the dye to travel up the yarn until there was no white left. Because blue and red dyes take up at different rates this created some very interesting effects where the two dyes met and mean that only part of the yarn is truly pinky plum (which I'm calling berry) or blue. I like it. 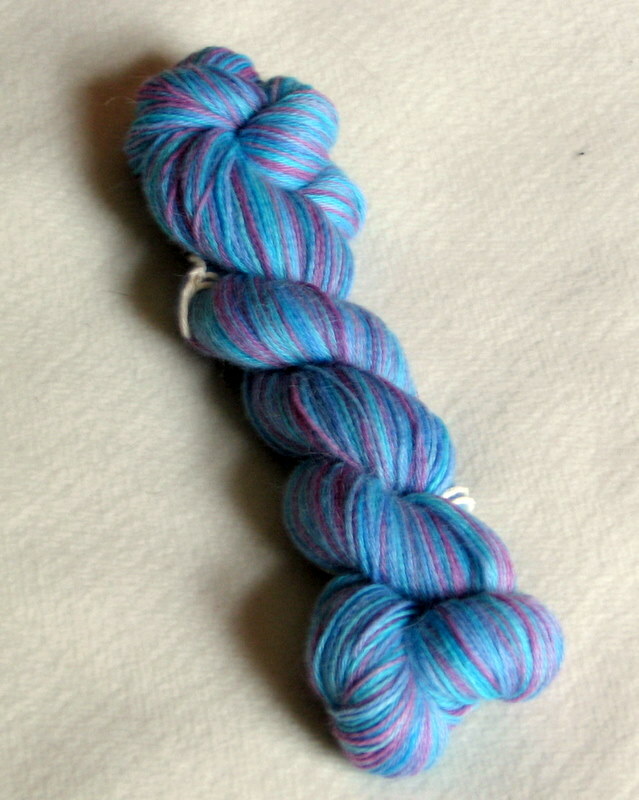 Next up, the single skein of alpaca 4 ply, with a touch of nylon (10%) which I dyed using Kool-Aid type soft drinks. As shown in a previous post, I used two dye baths one containing two packets of Kool-Aid in dark cherry and the other a Kool-Aid clone in grape. The colour here was far more subtle and the alpaca was much slower to take up the dye so I left it soaking while I had lunch. When I came back, the yarn still had some undyed bits which I left as they were. Very pretty and again, I like it. This is a single skein of alpaca 4 ply (again with a touch of nylon) which I hand painted using the semi-exhausted dyes from the BFL above (it seemed a shame to just throw the excess away) and a fresh batch of turquoise. It took a long time to do and even after it had dried I wasn't sure I liked the result... until I reskeined it this morning, that is. Now, all I can say is wow! I'm not sure what I'll do with it (or any of the others for that matter), but it sure came out purty. You where lucky after I left you and unpacked it was gone midnight and I had Jasmine my cat to placate after she was left on own for the weekend. 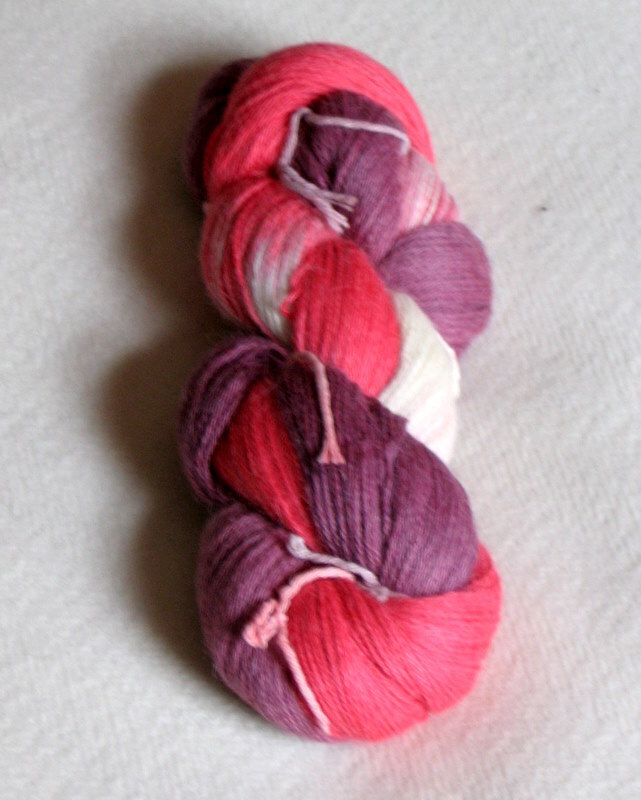 Looks like you managed to get the hand painted yarn into skein (did it take the whole garden? ), it looks very erm purty indeed. Wow - they are amazing - especially the last one! They're gorgeous: far better than my horrendous efforts! Can't wait to see a swatch.